Need a Warm & Relaxing 10th Anniversary Vacation, and Adventure, or Something Cheaper For Your Budget? It's your 10 year wedding anniversary - Congrats! 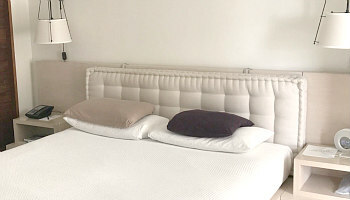 Maybe it's time for something special, a great getaway to help you reminisce and recharge. Or, perhaps the budget only allows for a cheap weekend getaway somewhere closer. We got ideas for both, and if you’ve got kids, we’ve got some suggestions if you’ve arranged a babysitter and want an adults-only getaway. Or, if you want to bring them along, and want a holiday spot to celebrate your tenth anniversary with kids (and even teenagers). Andaz Maui at Wailea - you’ve been married for 10 years now, so you earned more than just a trip to Hawaii. You deserve a beachfront vacation anniversary in Maui. The luxury rooms and soft white sands at the Andaz Maui at Wailea will do just perfectly, and Wailea is a very good bet for sunshine almost any time of the year. What Other Couples Liked About It: Bumbye Beach Bar...Modern Design...Master Bath Rain Shower. 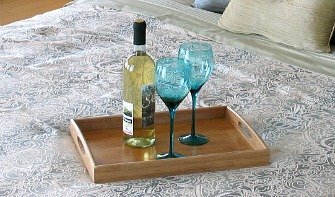 2017 ERV* Rating for Maui Romantic Resorts: 90% - Excellent. Activity For Your Maui 10th Anniversary Vacation: Don't miss a scenic driving tour driving on the Road to Hana. Stop frequently to take in some of the best views of the Maui Coastline. Westin Princeville Ocean Resort Villas - Unique, romantic, dramatic, spectacular. That sums up not just Kauai’s North Shore, but this Westin Resort as well. 4 heated pools, and studio and 1 bedroom villas with Whirlpool tubs and walk-in showers. What Other Couples Liked: Free Shuttle to the St. Regis...Starbucks Coffee in the Market...Quiet Pool. 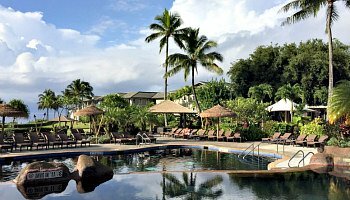 2017 ERV* Rating for Kauai 10th Anniversary Getaway: 84% - Excellent. 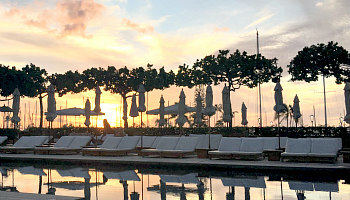 The Modern Honolulu - close to the Ala Moana Shopping Center and the beach, the Modern lives up to it’s name with minimalist decor, dining, and a lobby wall of books that rotates into a bar with nightly cocktails and music. 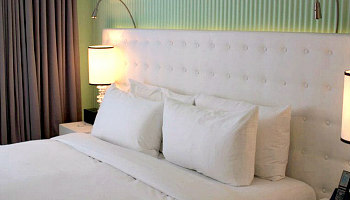 What Other Couples Liked: Great Oceanfront Suites...Stylish with a Boutique Feel...Excellent Pool. 2017 ERV* Rating for Honolulu Anniversary Vacation: 92% - Excellent. Fun Things to Do on an Oahu Ten Year Anniversary Trip: Grab a picnic lunch and do the short hike into dreamy Manoa Falls in East Oahu ($5 to park and hike in). 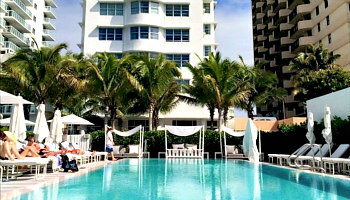 COMO Metropolitan Miami Beach - give your 10th anniversary getaway a wonderful mix of Art Deco, luxury and Latin flair. The COMO offers up rooms with lake and ocean views, and on the top floor a gorgeous rooftop hydrotherapy pool. What Other Couples Liked: Traymore Restaurant...Turn Down Service...Private Beach. 2017 ERV* Rating for Romantic Miami, FL Anniversary Getaway: 93% - Excellent. What To Do On Your South Florida Tenth Anniversary Trip: Stroll hand-in-hand along iconic Lincoln Road promenade in South Beach. On weekends this fashion and entertainment center transforms into a unique Farmer’s market representing numerous cultures. 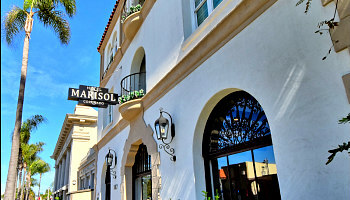 Plunge Pool Suites - Check out our guide to romantic suites with in-room private plunge pools in the U.S.
Hotel Marisol Coronado - beautiful Coronado Island is a great spot for any anniversary. 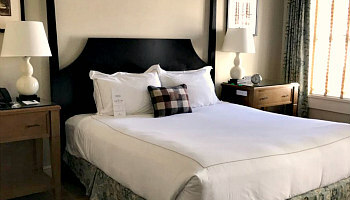 Book your vacation at this gorgeous boutique hotel, and you’re in for a treat: arrival champagne, complimentary breakfast, spa robes, HD TV & fast Wi-Fi, Italian sheets, and in the Junior Suites, a jetted air tub. 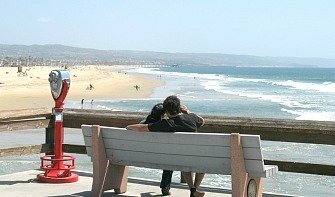 What Other Couples Liked: Free Bike & Beach Chair Rental...Liquor Store/Deli Across the Street...Quiet Location. 2017 ERV Rating* for a 10th Anniversary Getaway in California: 98% - Excellent. For Your San Diego 10th Anniversary Getaway: Gaslamp Segway Tour from Another Side of San Diego Tour Company. See the best of this most romantic city. 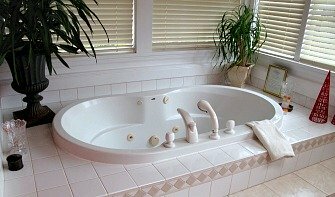 California Hotel Hot Tub Suites - romantic hotel rooms with Whirlpool suites in Los Angeles, San Francisco, Northern California & more. 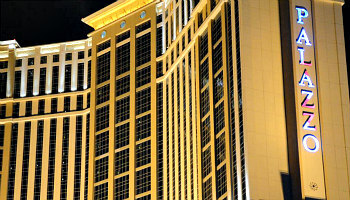 Palazoo Resort Hotel - Las Vegas is a fine destination for your 10th wedding anniversary - in the right hotel. You don’t want to endure a noisy, crowded & cheap resort, or worry about money in something too expensive. The Palazoo strikes the right balance, with large suites, an impressive mix of places to eat and entertainment, and easy access to all the Italian art and Gondola rides at the Venetian next door. What Other Couples Liked: Sunken Living Rooms...View of the Strip...Great Restaurants. 2017 ERV Rating for Anniversary Hotels in Las Vegas: 90% - Excellent. To Do On Your 10th Anniversary in Las Vegas: Get tickets for the Eiffel Tower Experience on the half-hour in the evening so that you can not only take in the 365 Degree views, but also have a bird’s eye view of the water fountains show at Bellagio. Or: don't miss the cocktail lounge at the Mandarin Oriental. 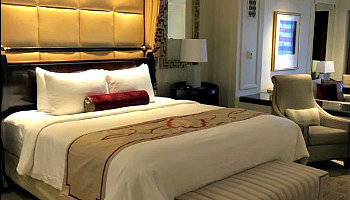 Las Vegas Hotel Jetted Tub Suites - our guide to hotels in Las Vegas and Nevada with private in-room hot tubs. Kimpton Taconic Hotel - escape the city on your anniversary for some peaceful relaxation and a chance to explore the fantastic New England outdoors. 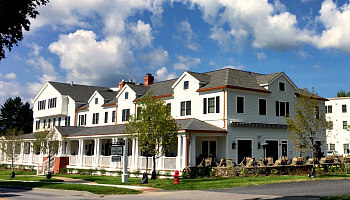 Check out this romantic small hotel tucked away in the attractive New England town of Manchester VT. Luxury linens, mountain views and await in their gorgeous rooms, and there's a fitness center and heated pool (in season). What Other Couples Liked: Relaxing on the Front Porch...Cozy Fireplace Inside & Fire Pit Outside...Evening Wine Hour. 2017 ERV Rating for a 10th Anniversary Small Hotel Getaway in Vermont: 97% - Excellent. Don't Miss on Your Vermont Anniversary Getaway: Lye Brook Falls is just 5 miles away from the Kimpton, just one of many great outdoor excursions in the Manchester VT area. 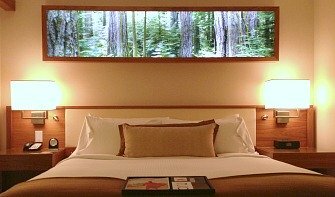 Hotels & Waterfalls - more ideas with our guide to romantic places to stay near waterfalls in the U.S. Excellence Punta Cana - not every couple can spend their 10th anniversary under palm trees at a Caribbean resort. At this romantic resort in the DR, you’ve got your own secluded stretch of white Dominican beachfront to enjoy, plus luxury suites (including swim up and plunge pool), as well as options like zip lining, snorkeling, and excursions to Isla Saona. 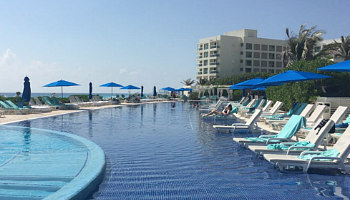 What Other Couples Liked: Cascade Pool...Swim Up Bar...Horseback Riding on the Beach. 2017 ERV Rating* for Caribbean All-Inclusive Anniversary Getaways: 88% - Very Good. Don't Miss: Some of the best resorts (including Excellence Punta Cana) will arrange a romantic sunset dinner for two on the beach. You’ll be served by tuxedoed wait staff and surrounded by torches. 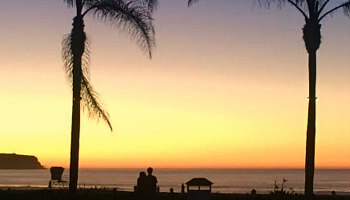 Hyatt Regency Grand Cypress - an affordable anniversary getaway resort that's surrounded by tons of things to do, but still offers enough quiet spots to relax in. 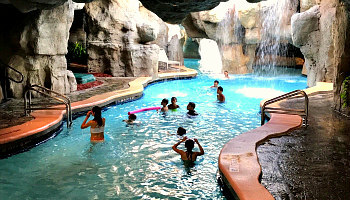 The Hyatt has programs for kids (Camp Hyatt), and a wide variety of activities (water slide, waterfalls, rock climbing, paddle boarding, scuba lessons) to keep both kids and teenagers busy too. For a romantic touch, ask about pool-view rooms that have a view of the nightly Disney fireworks. What Other Couples Liked: Lakeside Fire Pit...Walk to Restaurants & Downtown Disney...Beautiful Rooms, Gorgeous Grounds. 2017 ERV Rating* for Mexico 10th Anniversary Vacations: 86% - Excellent. For Your Orlando Anniversary Getaway: make the short drive over to downtown Winter Park, FL for restaurants, wine tasting and beautiful Azalea Gardens. Check our guide to romantic Orlando for more info. 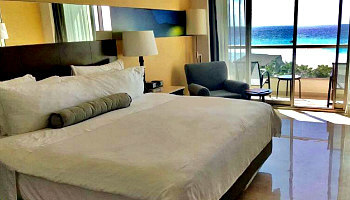 Live Aqua Beach Resort - if you prefer a child-free tenth anniversary getaway, this adults-only resort on Mexico’s Mayan Riviera could be just the R&R you need. Take your pick of ocean view and oceanfront rooms with balconies, and out in the sun, no less than 7 pools with varying temperatures. What Other Couples Liked: Mojito Bar...Views of the Ocean...20 Minute Foot Massage. 2017 ERV Rating* for Mexico 10th Anniversary Vacations: 93% - Excellent. Mayan Riviera Anniversary Idea: Cancun-Take a 15-minute boat ride to Isla Mujeres. Rent a golf cart or mopeds and circle the Island. Be sure to include a visit to Dolphin Discovery and swim with the sea life. Unforgettable.